Oh the horror.... For ragweed sufferers it's no wonder this plant is still hanging around for the month of Halloween. This pesky weed causes all sorts of trouble for people from August right through until the end of October. It's really nice to be enjoying a warmer fall this year in Ontario than what is typical, but that also means that ragweed season feels like it will go on forever! Those bright yellow clusters of flowers you see everywhere right now often get accused of being ragweed but are actually not. That's Goldenrod. 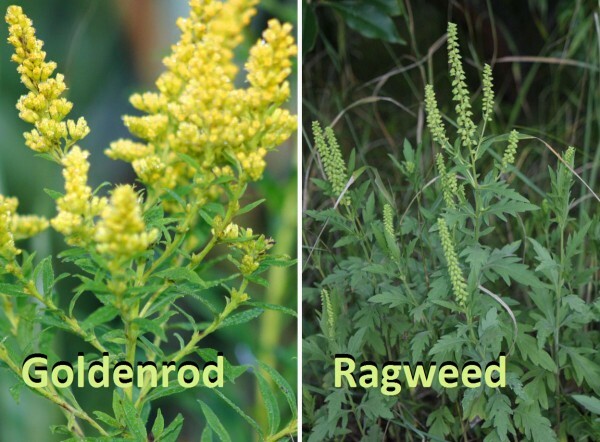 Ragweed is similar in shape but has green buds which sometimes bloom into white flowers. There are small and large varieties and there are actually 18+ strains! "This treatment is amazing! I'm a mess every fall. Have been for years. Ragweed season is unbearable. I always sneezed so badly and even with the windows closed I would wake up in the morning with a stuffy nose that would bleed when I cleared it. My eyes were also itchy and burning. After testing with Jocelyne, I learned that not only were 18 strains of ragweed a problem but a few other weeds. It only took one appointment with her and all my symptoms are gone. Gone! How is this possible?! This is amazing work, I only wish I had heard of it years ago. At least I won't have to deal with ragweed going forward. Thank you so much, Jocelyne."